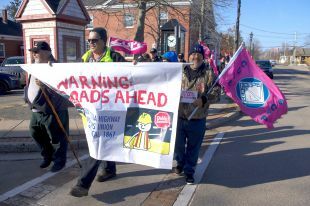 Members of the Nova Scotia Highway Workers’ Union (CUPE Local 1867) marched in downtown Middleton today to protest what they say are the Liberal government’s plans to shut down the province’s new asphalt plant. 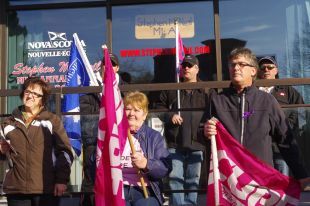 They started at Premier Stephen McNeil’s Middleton constituency office. When they discovered it was closed, they walked through the town handing out flyers. 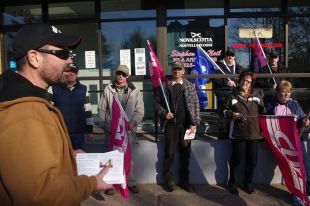 Nova Scotia Highway Workers’ Union (CUPE Local 1867) president Steve Joy talks to his troops in front of Premier Stephen McNeil’s office in Middleton. McNeil was out of the province. 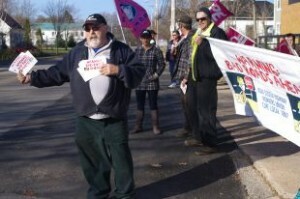 A CUPE member holds out flyers about the province’s paving plant that they say government plans to close down.